Brunswick Dental Care: Wael Ibrahim, D.M.D. Dr. Wael Ibrahim graduated from the University of Medicine and Dentistry of New Jersey and subsequently completed his residency at Robert Wood Johnson University Hospital. He was later awarded the position of attending Dentist at Robert Wood Johnson, where he trained new residents and assisted with the hospital’s dental department. He also sat on the board of the New Jersey Dental Association, both sharing with and learning from the area’s top clinicians. 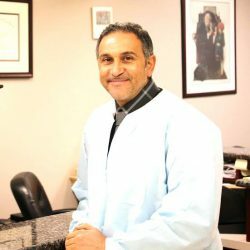 Dr. Ibrahim’s ongoing commitment to continuing education reflects his passion to treat his patients with the best, scientifically validated procedures, encompassing cosmetic, restorative, and general dentistry. Dr. Ibrahim has earned honors for his work in prosthodontics and was a recipient of the New Jersey Dental Alumni award. His knowledge and mastery of a broad spectrum of dental technologies is enhanced by his compassion, humor and gentle approach to dentistry. Dr. Ibrahim is also a passionate sailor, charting nautical courses both locally and internationally. Along with his wife and 4 children, he enjoys fishing and sailing off the Sandy Hook Bay.